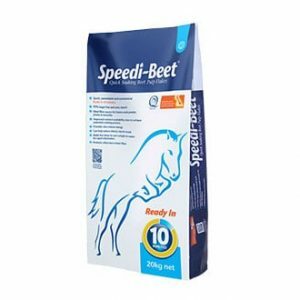 Dr Tom Shurlock, nutritionist with British Horse Feeds for Speedi-Beet & Fibre-Beet, discusses the benefits of beet fibre, micro flora, pre and probiotics, for horses and ponies and how they impact gut health. 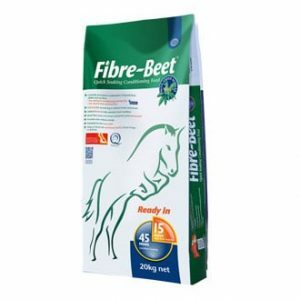 Beet fibre has long been used as an equine feed due to its nutritional suitability, supplying high levels of slow release energy whilst minimizing sugar intake. Speedi-Beet, the Original 10 Minute Quick Soaking Beet, was developed using a unique patented cooking process. As such it is recognized as a super fibre with a superior DE value similar to grain and can be used to reduce reliance on grain/hard feeds whilst maintaining condition and activity. There is, however, far more to beet pulp – and especially its fibre – than its supply of nutrients. Of these attributes is beet fibre’s impact on the gut environment. First, don’t be misled by some of claims that beet pulp is a probiotic! Probiotics are cultures of live microbes that are fed to colonise the gut. They have positive benefits through several mechanisms. They can attach to the gut linings and so block pathogen adhesion; they can add to the fermentative profile of gut microbes which in turn can provide benefits for the gut environment – as such fibre fermenters would be preferable for the horse. Generally, though, they are based on lactobacilli or bifidobacter that are inappropriate for the horse. Firstly, they are unlikely to reach the hind gut alive and secondly, they are lactic acid generators, suitable for humans and dogs but not horses; horses may, however, benefit from probiotic yeasts, although viability cannot be guaranteed. Beet fibre, though, is a prebiotic. More correctly it has the characteristics of a prebiotic as the definition is of a “typically non-digestible fibre compound that passes undigested through the upper part of the gastrointestinal tract and stimulates the growth or activity of advantageous bacteria that colonize the hindgut by acting as substrate for them”. It is usually a term reserved for short chain fibres (oligosaccharides – such as FOS, MOS & GOS), inulin or similar products. However, research has shown that fermentation of beet fibre in the hindgut of horses generates more energy as volatile fatty acids (VFA) and is promoting fermentation of other feed stuffs present. It is believed the fermentation benefits and so promotes hemicellulytic bacteria, and it has been shown beet fibre can increase the fermentability of alfalfa by 25%. The fermentation pattern of beet fibre has a positive impact on gut health. The hindgut is the fermentation chamber of the gastrointestinal tract. Under optimal conditions the microflora populations breakdown feed fibre and nutrients that have escaped undigested from the small intestine. In some situations, these latter may cause disruption both in population shifts and fermentation of starch and protein. This generates lactic acid and endotoxins such as amines and nitrites that are rapidly absorbed across the tight junctions between the gut wall cells (lactic acid enlarges these junctions) and act as toxins and inflammatory agents in the body. By contrast beet fibre generates a higher proportion of butyric acid (one of the VFA); butyric is the major energized of hindgut cell and also reduces the tight junctions, providing an efficient barrier against larger molecules, including exo- and endotoxins. However, there is another barrier function of beet fibre. Fibre is a term for carbohydrates where the molecules are linked by a chemical bond that can only be broken by certain micro-organisms. The carbohydrates involved are chains of sugars (polysaccharide of glucose is cellulose), and a major component of the soluble fibre portion of beet (accounting for up to 1/3 of total fibre) is pectin, a gel-like polysaccharide of glucuronic and uronic acids. Low molecular weight pectins, including beet pectins, have been proven to help generate the mucilage secretion that lines the gut wall, acting as a barrier against microbial adhesion, as well as a permeator for nutrient digestion and so is critical for the correct functioning of the gut. The second barrier function takes place in the stomach of the horse. Under acidic conditions pectin is released from the fibre matrix and, in the presence of surfactants and emulsifiers, will incorporate into the mucilage lining the stomach adding to the matrix. The mucus lining of the stomach is critical to the protection of the stomach cells both to secreted acids and microbial attack, a functioning mucal lining is essential. British Horse Feeds make a complementary feed called Fibre-Beet that, in addition to its core function as a conditioning feed, has the components that effect mucus incorporation; it contains alfalfa. With work conducted with Dr Jo-Anne Murray and her team at The University of Glasgow, findings have shown Fibre-Beet can buffer stomach acid to Ph4, more so than hay. Fibre-Beet, therefore, has the ability to support correct stomach acidity and incorporate pectin into the mucus lining. 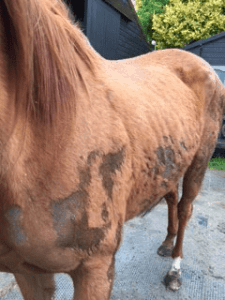 As an illustration; Kevin & Pam at New Beginnings, a charity that British Horse Feeds supports that rehomes ex-racehorses, took in an eight-year-old thoroughbred gelding with an extremely poor condition score. Under a regime of dedicated TLC and good quality grazing and a fibre pellet, New Beginnings brought his condition score up to a healthier, survival level. After this period of settlement, it was decided that an internal examination would be advisable. Ulcers (EGUS) are a problem that sometimes don’t easily manifest themselves outwardly. Specialist vets came to New Beginnings to pass an endoscope into the horse’s stomach. Despite his initial improvement there was significant ulceration in the glandular region, with evidence of bleeding in the pyloric antrum. After the consult, and on the recommendation of the veterinary surgeons, the gelding had Fibre-Beet added to his diet. After 5 weeks, the horse was rescoped and the damaged areas investigated. It was immediately obvious that almost total improvement had occurred. A slight reddening in the glandular region was noted on the official report, and significant improvement in the atrium. In short, the ulcers had all but disappeared, the only husbandry change being the introduction of Fibre-Beet. We are all delighted that he has made significant gains and looks much healthier and happier as can be seen! Beet fibre, on its own, or in conjunction with alfalfa (a buffering feed) and emulsifiers, effects beneficial characteristics in support of normal gut integrity. It moderates microbial populations, encouraging useful fibre digesters – as a prebiotic, supplies significant levels of butyric acid, that the hindgut preferentially uses, and helps maintain tight junction function. It also supplies pectin that, on its own, helps mucin production in the small and large intestine or, in combination with other factors, builds up the mucus lining of the stomach. Beet fibre: More than the sum of its parts.